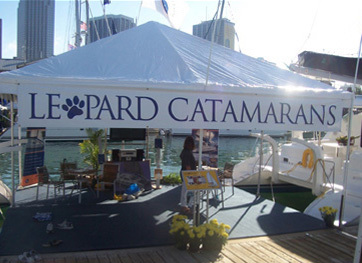 This 10x20 outdoor canopy tent is the perfect choice for larger outdoor gatherings and displays. With corners, center crown, and side fittings constructed of welded steel, this tent frame promises sturdy support for the heavy duty "Block Out" top. Frame parts are made of two inch 6005 T-5 schedule 10 anodized marine aluminum tubing and connect with durable pins. Canopy includes straps and buckles that have been sewn in 32 ounces of material as well as reinforced patches at points of wear. Secure canopy with double reinforced curtain rope and rust resistant buckles. When properly assembled, this tent can withstand wind gusts of 40 to 75 mph depending on ground condition. Tent measures ten feet long by twenty feet wide and includes the top, frame, stakes, guy ropes, storage bag, and set-up instructions. This tent is available in a variety of top colors and includes a one year manufacturer's warranty.